A small medicine shelter consisting of three upright sticks and a grass covering with sections of pot covering the medicine beneath, set within a cultivation. 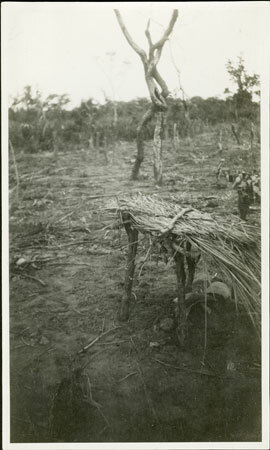 Since medicines to protect crops (such as bagbuduma) are vulnerable to damp and cold they were frequently placed in such shelters to protect them, or covered by an inverted pot or in the hollow of a tree. Morton, Chris. "Zande medicine shelter" Southern Sudan Project (in development). 03 Jan. 2006. Pitt Rivers Museum. <http://southernsudan.prm.ox.ac.uk/details/1998.341.731.2/>.